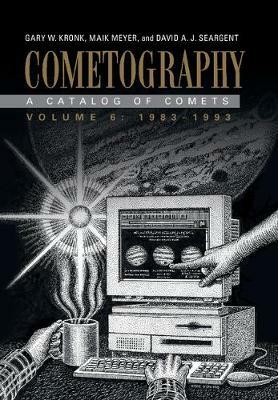 Author(s) Kronk, Gary W.; Meyer, Maik; Seargent, David A. J.
Cometography is a multi-volume catalog of every comet observed from ancient times up to the 1990s, when the internet took off as a medium of scientific record. It uses the most reliable orbits known to determine the distances from the Earth and Sun at the time of discovery and last observation, as well as the largest and smallest angular distance to the Sun, most northerly and southerly declination, closest distance to the Earth, and other details, to enable the reader to understand each comet's physical appearance. Volume 6, the final volume in the catalog, covers the observations and pertinent calculations for every comet seen between 1983 and 1993. The comets are listed in chronological order, with complete references to publications relating to each comet and physical descriptions of each comet's development throughout its apparition. Cometography is the definitive reference on comets through the ages, for astronomers and historians of science.